As some of you are already aware, a business named Author Shout runs competitions that basically promote books via their covers. The idea is to encourage as many votes as possible for ones own book. The competition is open for 1 week, and voting can be done daily up until Sunday 8:00am EST so you have potentially 7 votes available to use if you so wish. Promoting a book at an international level is either a very costly exercise, or a very time consuming one and often frustrating one, so opportunities like this are really appreciated. 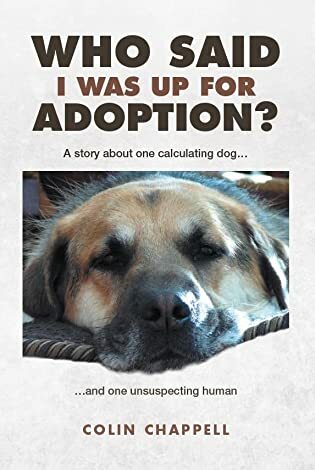 Personally (no bias here), I think Ray’s face on “Who Said I was up for Adoption?” presents a much more interesting book cover than any of the others but, as is usual, it is easy to state that…. but to prove it one has to accumulate many votes! I am sure that you all know where this is going don’t you? Please give serious consideration to spending a few moments on the Author Shout site every day from today through to next Sunday at 8:00am EST and vote for Ray! Well you are really voting for my book… but Ray is the star after all! Remember “Who Said I was up for Adoption?” by Colin Chappell (but it’s all about Ray!). Just voted again. Happy to see Ray in the top 5 anyway! Ray’s gorgeous face takes 1st place in my book! I voted for Ray and made a note to do so again tomorrow! So glad I came across your comment … it had slipped my mind, but I just now voted again! I voted for Ray’s cover! Thank you Ann. We are not doing too well against some of the competition! Thanks Monika. Now if you could get my 2 buddies there a laptop each, then I could get 3 votes a day from you guys. Just think! Woof! Ray. Hi Ray – tell your Dad I just voted for your cute face and am saving the link. Are the other voters blind? Hi Tink. Given that none of the competition are as cute as me… the other voters must be blind. Many thanks for your votes. Woof! Ray. As they say (or used to say) in Chicago – “vote early and often”. Which of course I just did. Good luck! Already placed my vote. I Couldn’t say no to ray’s face beckoning. Saved the link so I can place the votes daily. All the best. I saw that you are in very good company! Done! Here’s a suggestion. Put the link on your posts every day for the next week just in case someone (like me) forgets. There are a few with more votes than Ray (that’s just not right!) so everyone needs to vote!